So we've been pinned down for three days now by the storm blowing through the Pyrenees Orientals and have taken the opportunity to review our last 6 months on the road, including what it's cost so far. It's a question a lot of people have asked us and one which we obviously wanted to know before we set off as well. However, in reality how much it costs really depends on what you like to do, how far you want to drive, where you want to stay, what you want to eat etc. UPDATE JAN 2016: Below is the post we wrote in December 2014 after 6 months of touring and also explains our spending categories in detail - these costs have since been updated and compared with our motorhome tour in 2015 here. When we left the UK in May 2014 we had an estimated monthly budget based on research we had done online and scaling down our existing monthly costs from life in the UK. Our budget included campsite and parking fees, food and toiletries, diesel, LPG, mobile/internet, ferries and tolls, motorhome overheads, travel insurance and 'fun'. We record absolutely every euro cent we spend in a spreadsheet so we can keep track of exactly what's going out. Within each of our spending categories the exact spending has differed from month to month, for example, in a a month where we spend some time on a campsite our campsite fees tend to be a little higher but as we don't move as far our diesel expenditure is lower. However, overall we're pretty pleased with how closely the overall cost has tracked what we'd planned for. Below are some notes relating to each of the expenses above, hopefully giving a bit of a better picture of what we've spent and how we've grouped our costs together. Wherever possible we have tried to stay on free motorhome aires. Some motorhome aires cost a small fee which may or may not include some services. We have met some motorhomes who prefer to not pay these nominal parking fees (often just a few euros a day) but we prefer to pay these out of respect for the local community providing the service and so we can sleep easier without risking a fine. Depending on the region or country, motorhome aires generally have a service point where you can empty your grey water tank and toilet cassette for free and may or may not charge a small fee (i.e. 2euros/100L) for drinking water and/or electricity (i.e. 2euros/4 hrs). We haven't paid for water yet and take every opportunity to top up the fresh water tank when we can. We've only paid for the electricity service twice when our charge was low since we don't have a solar panel or second leisure battery on board which would have overcome this. We have found some motorhome aires which cost more than campsites so we haven't stayed there. To find the aires, we have used and have been pretty happy with the reliability of Campergids Europa (English version: Camperstop Europe) but we have been recommended many other books like the 'All the Aires' series, apps or even options to download co-ordinates into certain SatNavs. France has been by far and away the best set up for motorhome tourists in terms of frequency and quality of aires. We have met lots of motorhomers who say they never stay on campsites. However our preference has been to recharge the motorhome and ourselves by staying on some campsites occasionally. Also in Switzerland some areas had no free options and 'wild camping' was strictly policed so we had to stay on campsites to visit the areas we wanted to. We have not paid more than 16 euros per night and often closer to 10 euros as we carry the ACSI card. We have only stayed on participating campsites and look for the ones that offer the lowest rate (10 or 12 euros a night) and which offer multi-night stays discounts (i.e. 7 for 6, 14 for 11). Sometimes there is a small tourist tax per person as well. The ACSI discounts weren't available in July and August but as we were in France at the time there were plenty of motorhome aires to choose from. On some occasions we have had to pay a day parking fee (in nature reserves or in a town or city) in addition to our overnight charges and these have been included in this section. Doesn't need explaining except to say that prices can vary massively within a few miles. We have found it useful to keep up to date with a countries average diesel price online and use this as a benchmark, stopping to fill up when we see a good deal. Supermarkets tend to offer the best prices but as in the UK it is not necessarily the best quality fuel so occasionally we do fill up with a slightly more expensive (several euros per litre) premium brand which we do seem to improve overall fuel consumption. Our compact motorhome has been designed to carry 2x 6kg Calor bottles in the UK. However this wouldn't last us the year so we have had to buy an adapter so that we were able to use French 5.1kg Propane gas bottles (primagaz). This cost obviously varies depending on the specifics of the motorhome and our gas supply would be cheaper if we could have been able to carry the larger standard size 13kg bottles which are better value per kilo of gas. This is definitely something we haven't got quite right this year. Since leaving the UK, some network operators like 3 have begun offering some very good contracts that allow you to use your minutes and browsing time in Europe as well. As this wasn't the case as we left the UK, we had planned to pick up local sim cards but have found this a little trickier than expected since the usage conditions are sometimes restricted i.e credit must within 30 days. We have a UK vodafone PAYG sim on eurotraveller rates, which was intended primarily for a back up but which we have been using to receive calls from family at between 4-8p a minute. For internet access we try as much as possible to use free connections, such as McDonalds and tourist offices but sometimes we need a secure connection for banking so use a 3 PAYG sim at 10p/MB. We did want to pick up local sims for this as well but ran into the same restrictions as with mobile and found that moving between countries made it difficult to justify purchasing the long-term cheaper rate packages. Being EU citizens, we have applied for and have a EHIC (European Health Insurance Card – the old E111) to access basic medical care. We understand that this allows you to benefit from the same free provision as locals. Although in the UK we are used to all medical care, bar prescriptions, being free, this isn't the case in all of Europe. Also since we both have some chronic conditions we choose to take out additional travel insurance selecting the Backpacker Silver policy from Insure&Go to make sure that all our conditions would be covered. This has the additional benefits that come with a standard travel insurance policy such as luggage and personal possessions cover when we are out and about, even mountain rescue which is especially reassuring for us as these costs aren't free and can be quite high in some European countries. For 2 people disclosing 4 chronic health conditions our policy works out at £35.41 per month. This part of our budget is still partly estimated and a fixed amount wont be certain until the end of the year. Every month we set aside £299 as motorhome overheads. Some other motorhoming costings we have seen online exclude these costs and although these costs are going to depend on the specifics of the motorhome, we wanted to include this in our monthly living costs and also detail how we reached this number for completeness as in the real world we are having to plan to maintain our motorhome. For the repairs/parts/depreciation we hope this is an overestimate but we have tried to be pessimistic for this item in the budget to avoid any tasty surprises. So far to date we have had spent £148 on repairs to our water system, installing the gas adapter, a new wiper blade and having a new lock installed on the back door. This includes our ferry across to Holland (discounted with caravan club membership) and the occasional use of toll roads, including two trains through the mountains in Switzerland. On the whole we try to avoid toll roads as we are not in hurry to get from place to place. We have also found that we can't really make use of the 130kph speed limits tending to prefer cruising at around 90kph which just so happens is the speed limit on the non-toll roads. The only downside is that there are frequent roundabouts and 50kph speed limits through villages. But we aren't in hurry and quite like experiencing the scenic route, often finding interesting places to stop along the way which we hadn't planned for. We also get a little nervous about tolls because it is hard in advance to find out exactly how much the cost is going to be without permanent internet connection (there are website toll calculators). 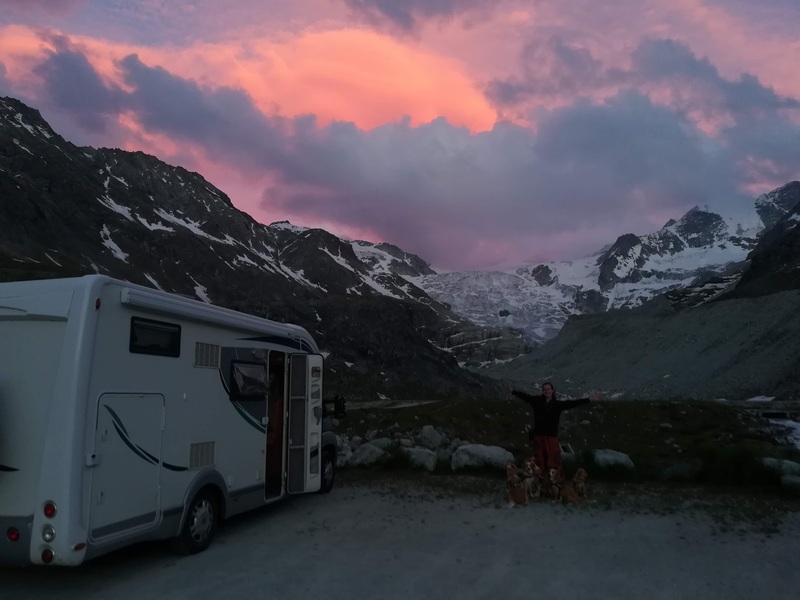 When we have check, other than time, it's not been particular obvious to us that travelling in our motorhome there would be a worthwhile saving to offset the toll cost. However, in Switzerland we paid the fixed fee of 40chf (approx £26) for the motorway vignette which allowed us to use all the motorways. The cost of food and toiletries is a highly variable and personal amount since everyone has different food preferences. We are aware that our food costs are higher than most other people we have met. However we don't eat out as we prefer to cook for ourselves using lots of fresh local ingredients, organic if available, and enjoying trying news recipes. We do save money buy not smoking, drinking alcohol or eating meat (although this is a health choice rather than a deliberate cost saving). This section also includes our spend on toilet paper, drinking water, toiletries & laundry products and motorhome consumables (toilet fluid and sterilising tablets for the water tanks). Generally, we are trying to shop at local markets as we find that they do offer fresher produce at lower prices than the supermarkets. Supermarkets are very handy for non-perishables and toiletries. We have enjoyed finding new ingredients at Bio (organic/ecological) supermarkets which tend to be more popular in France and Holland. When it comes to comparing food prices in different countries so far we have found that if you shop around and buy what tends to be on offer or in season rather than insisting on a fixed shopping list, that the costs for us have not massively varied between the countries we have visited so far. Everything that is not the above we class as 'fun' Fortunately for us a lot of our leisure activities are free (hiking and biking) but wherever possible we have also made use of a number of free museums, services (Liberte Pass / Saas Pass) etc offered to tourists. Plus travelling in a motorhome is our fun! We have paid for some museums and cable cars etc when it was something we just couldn't pass by without a visit. Also any maintenance costs to our bikes (i.e. new tyres and brake pads) due to wear and tear have been added under 'fun'. We don't eat out but as stated above this explains why our food spend is a little higher as we prefer to experiment with local ingredients and new recipes in our motorhome kitchen. Surprisingly, a large part of 'fun' expenditure has been on stamps. We love keeping touch with friends and family back home and it's been important to us to sending cards (self made from tourist material collected on the road) the old fashion way especially to people who don't have the internet (grandparents etc) or on special occasions. We also like reading and download several books every month to our tablet which is also included in this 'fun' section. This wasn't originally in our estimated budget which was an oversight on our part. We had thought that we could hand wash everything but in reality its just not always practical to hand wash things like bed sheets without good weather and convenient facilities. We hand wash as much as we can but occasionally using a self-service laundrette (or facilities within supermarkets) or campsite washing machine for the more awkward items. Prices vary widely but we try to stay as close to 3-4 euros per 5kg wash. As we do a lot of outdoor activities we do tend to generate quite a bit of laundry. In addition to the detailed motorhome costs we do still upkeep a couple of insurance policies back in the UK (life insurance etc). Esther has also made a trip back to Holland to visit family and the cost of the return travel to Amsterdam from Geneva hasn't been included (approx £80). We also both require a number of medical and dietary supplements which are personal to us so we haven't included the cost of these. For Christmas (we've shopped early!) and special occasions (like weddings) we have also bought a few smalls gift for family and friends back home which again hasn't been included in the monthly average.